Beautiful Villa on the Empuriabrava canal with a 12m mooring It consists of a living room - dining room, 1 fully equipped kitchen, 3 bedrooms, 3 bathrooms with wc, terraces, swimming pool Extra's: parking, garage, double glazing .. This house is located on the canal with a private mooring of 12m It consists of a living room - dining room, a fully equipped kitchen, 4 bedrooms, 4 bathrooms with wc, terraces, garden, swimming pool .. This modern Villa is located on the Empuriabrava canal with a 15m mooring It consists of a living room - dining room, 1 fully equipped kitchen, 4 double bedrooms, 4 bathrooms with toilet, terrace, garden, swimming ..
Beautiful property in Palau Saverdera, 10 minutes from Roses and the beach. It consists of a huge living room - dining room, 1 equipped American kitchen, 5 bedrooms, 4 bathrooms with wc, solarium, an independent studio Extra's: ..
Beautiful house to the large canal, with pool and mooring. This villa is located on the wide canal of Empuriabrava with a mooring of 12.5m It consists of a living room - dining room, 1 fully equipped American kitchen, 5 bedrooms, 4 bathrooms with wc, garden, .. 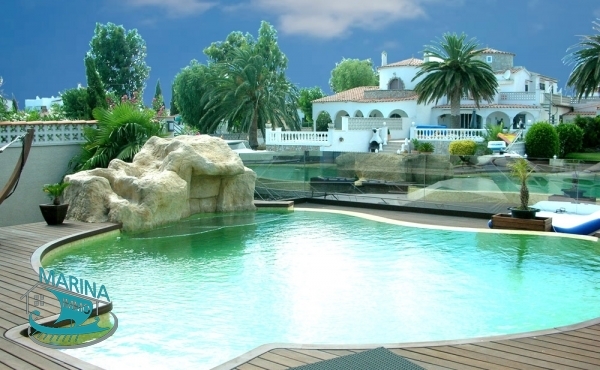 This villa is located on the main channel of Empuriabrava with 24m mooring and a boat garage! It consists of a living room - dining room, 1 equipped kitchen, 3 double bedrooms, 3 bathrooms with wc, ..